"Other paintings were on exhibition in the museum the Prince of Liechtenstein had built in his capital, but Ginevra was too precious to be hung with the rest of the collection. . . . Finally in August 1960 . . ., guided by the prince’s curator, we went into the cellar where there was a trapdoor balanced by a huge counterweight. The trapdoor was lifted, and we descended more narrow stairs to a deep subcellar, where a few of the prince’s greatest treasures were stored. . . . There, on a nail, I saw Ginevra hanging." 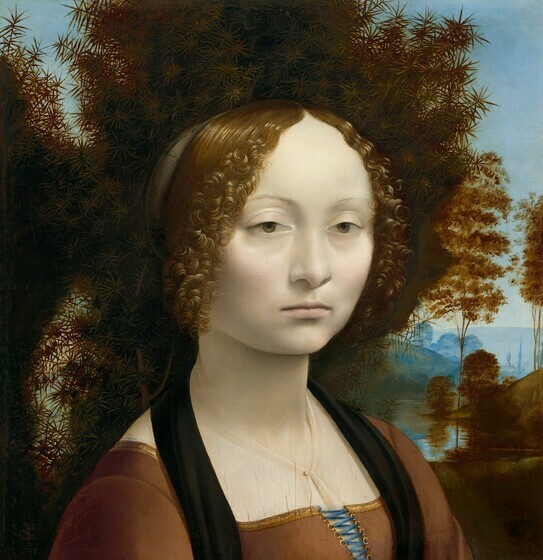 Walker made several more trips to Liechtenstein in hopes of obtaining the Leonardo for the Gallery, but it was not until early 1966 that the prince finally agreed to part with the painting. The reported $5 million price tag was the largest sum ever paid for a work of art until that time. The small panel traveled to Washington in a suitcase in the first class section of a commercial airliner that was delayed by a snow storm in New York. Its public debut in Washington was on March 17, 1967, the 26th anniversary of the opening of the National Gallery of Art ( fig. 3 and fig. 4). The house of Liechtenstein, so dubbed because of the light stone (liechten stein, or limestone) of the castle at its original family seat near Vienna, achieved princely status in the early 17th century. Its territory was consolidated around the Duchy of Vaduz in the early 18th century, but the family continued to occupy its primary residence near Vienna until close to the outbreak of World War II, when it relocated to Vaduz. At that time the princely art collection, already of great renown, was moved as well. Although Prince Karl I (1569–1627) had begun to assemble paintings, jewels, metalwork, and objets d’art, the more influential early collector in the family was his son Prince Karl Eusebius (1611–1684), who devoted most of his time to the arts. It was Prince Karl Eusebius who acquired the first painting by Peter Paul Rubens, The Assumption of the Virgin, for the collection, which to this day features a particularly strong holding of works by this artist. In 1693, Prince Karl Eusebius’s son, Prince Johann Adam Andreas I (1657–1712), acquired Rubens’s cycle of eight paintings depicting the life of the Roman consul Decius Mus, then believed to have been painted by Van Dyck. The cycle was originally created around 1617 as cartoons for tapestries that were produced in several editions. 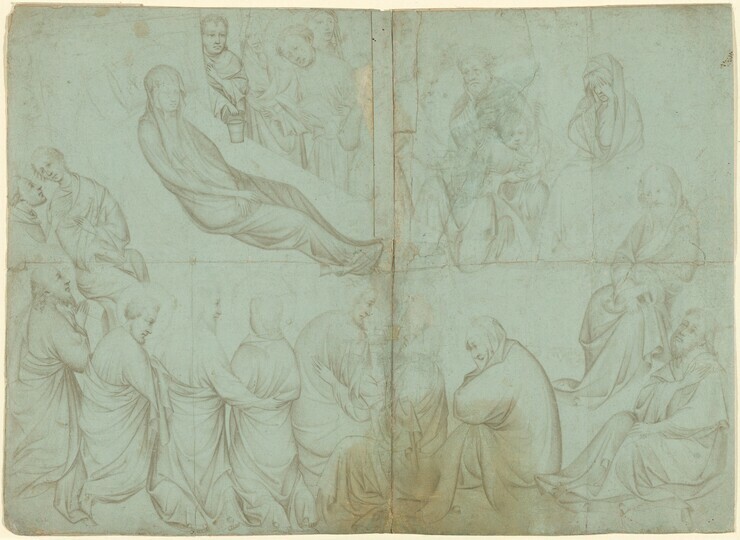 The National Gallery of Art owns a small oil sketch of the first work in the series, Decius Mus Addressing the Legions (fig. 5), that Rubens produced as a model for the life-size cartoons in Liechtenstein. Although paintings were regularly bought for and sold from the Princely Collections throughout the centuries, the reasons for these transactions are myriad, and didn’t always have to do with individual preference or changing tastes. By the end of World War II, the family had lost a large amount of its fortune. The art collection was one of the few remaining liquid assets that could be used to rebuild financial stability. 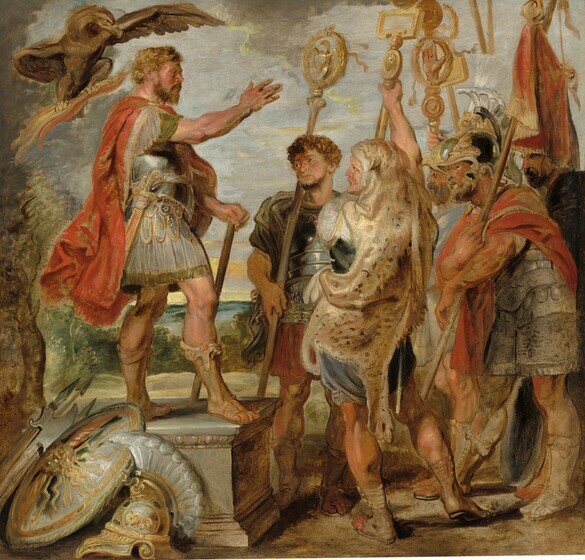 The family made the difficult but necessary decision to sell Ginevra de' Benci and several other important paintings, including Rubens’s Agrippina and Germanicus (fig. 6) acquired in 1963 by the National Gallery of Art. It is unclear when or how Ginevra de' Benci originally made its way into the house of Liechtenstein, but the work was a part of the collection by 1733, based on a red wax seal on the reverse (fig. 7). This same seal appears on the reverse of a pair of portraits by Joos von Cleve of Joris Vezeleer (fig. 8) and his wife, Margaretha Boghe (fig. 9), establishing these paintings as part of the Fideikomiss set up by Prince Johann Adam (1657–1712), which stipulated that the art collection and property in Vienna would belong to the reigning princes of the house of Liechtenstein in succession. In 1733 Prince Josef Wenzel (1696–1772) applied red wax seals bearing the arms of Liechtenstein to all paintings that were part of the Fideikomissgalerie. In addition to Ginevra de' Benci, the Rubenses, and the Joos von Cleve portraits, several other paintings and sculptures formerly in the Liechtenstein princely collection are now at the National Gallery of Art. 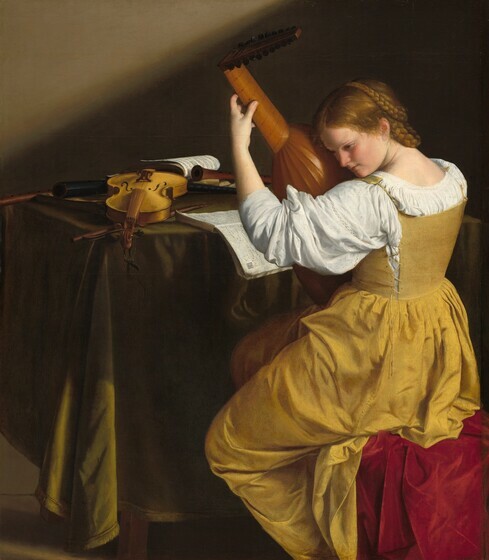 The Lute Player by Orazio Gentileschi (fig. 10) was also included in the Fideikomissgalerie, as it had been acquired by the house of Liechtenstein in Bologna in 1697. However, there is no visible wax seal because the back of the painting was relined during conservation in the early 1960s. A pair of genre scenes by Jean Siméon Chardin, The Attentive Nurse (fig. 11) and The Kitchen Maid (fig. 12), were acquired directly from the artist by Prince Josef Wenzel after the documentation of the Fideikomiss collection. Portrait of a Knight by Giovanni Girolamo Savoldo (fig. 13) had been acquired by 1659 by Archduke of Austria Leopold Wilhelm and descended into the collection of the Holy Roman emperors. By 1805, it had been traded to the Liechtenstein princely collection. Ginevra de' Benci is a rare example in which the princes sold directly to a museum without an intermediary. Zürich dealer Walter Feilchenfeldt handled many of the prints and drawings that left the princely collection, including those sold in 1948 to National Gallery of Art founding benefactor Lessing J. Rosenwald (fig. 14). First offered the enormous print collection, Rosenwald declined as there were too many duplicates of those he already owned. Feilchenfeldt then suggested that Rosenwald consider a few important drawings available from the princes. The collections of the princes of Liechtenstein have been regularly published and exhibited (see the bibliography at right). Today, portions of the Princely Collections can again be seen at the Garden Palace and the City Palace in Vienna. John Walker, Self-Portrait with Donors: Confessions of an Art Collector (Boston, 1974), 49–50. Click here for a copy of the 1967 press release (PDF 2.4 MB). Germain Seligman, Merchants of Art: 1880–1960; Eighty Years of Professional Collecting (New York, 1961), 256. Germain, the son of Jacques Seligmann, changed his name when he became an American citizen. Jacques Seligmann & Co., Inc., Franz Josef, William Reinhold Valentiner, and Germain Seligmann, A Catalogue of Seven Marble Sculptures of the Italian Trecento and Quattrocento from the Collection of His Highness, The Prince of Liechtenstein (New York, 1954): PDF (5.3 MB) available here. Strohmer, Erich V. Die Gemäldegalerie des Fürsten Liechtenstein in Wien. Wien 1943. Meisterwerke aus den Sammlungen des Fürsten von Liechtenstein: Die niederländischen Bilder in der Liechtenstein Galerie. Exh. cat. Kunstmuseum, Lucerne; Baldass, Ludwig. Lucerne 1948. Baumstark, Reinhold. Masterpieces from the Collection of the Princes of Liechtenstein. New York, 1980. Collections du Prince de Liechtenstein. Exh. cat. Musée national d'histoire et d'art, Luxembourg, 1995. Kräfter, Johann, Wilfried Seipel, and Renate Trnek. Rubens in Vienna. The Masterpieces. Vienna, 2004. Kräftner, Johan. Die Schätze der Liechtenstein: Paläste, Gemälde, Skulpturen. Vienna, 2013.